There's new love, endless love, and of course, LEGO love. The first is sweet, the second is timeless, and the third is both. The Model Building Secrets Blog has the story of Joe Sparano's proposal to his girlfriend -- which was done in a way that should make the less creative among us shudder. Under the guise of an anniversary picnic, he built and presented her with a series of three homemade sets that depicted their lives together. It was a fitting proposal for a couple that loves building and met on the job at Toys R' Us. And because Joe's batting 1.000, you might want to take his advice. Luckily, he's posted photos for how to build a minifig-scale ring. 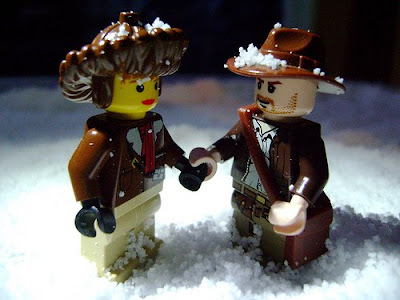 So get out there and start looking for LEGO love.